Medication and pharmacy errors make up a significant portion of medical malpractice lawsuits. Find out more about pharmacist negligence and how an expert medical malpractice lawyer in Portland can help. What is Pharmacist Medical Malpractice? Pharmacist malpractice is a type of medical malpractice that usually involves negligence. 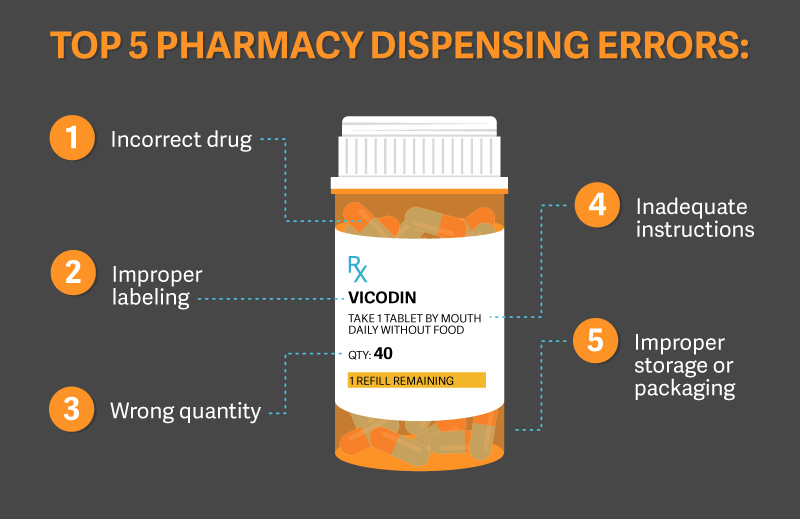 Pharmacist errors may include dispensing the wrong drug, failing to take a patient’s medical history into account, or failing to screen the collection of multiple medications prescribed by different doctors. Studies have shown that up to 10 percent of prescriptions are filled in error. What are the Legal Responsibilities of Pharmacists? Pharmacists are legally responsible for correctly dispensing medication to patients. When the wrong medicine or incorrect dosage of a pharmaceutical is dispensed, it may be considered medical malpractice. A pharmacist has the legal duty to consider any harmful interactions a medication may have with another drug a patient is taking. They must also take into account a patient’s current health condition as well as any known allergies. Minor mistakes by pharmacists may not lead to medical malpractice claims. However, if a significant error causes serious illness or damages to a patient, they may be held liable. In some instances of medical negligence, the oversight of a medical professional will not directly contribute to an injury or illness for a patient. As most people are prescribed medication when they have a pre-existing condition and are in need of medical treatment, a pharmacy error may increase the severity or accelerate a patient’s condition. Although a pharmacist’s negligence typically does not cause a condition to arise, they may still be liable for making an illness worse or inhibiting a patient’s ability to recover. Do You Have a Valid Pharmacist Malpractice Claim? As stated above, the validity of a pharmacy medical malpractice lawsuit will require proof of a pharmacist’s breach of duty, significant damages caused to a patient, and evidence that the pharmacist’s negligent acts caused the damages. A pharmacist’s breach of duty could involve distributing the wrong medication to a patient, adding or substituting an ingredient to dispensed drugs, providing inaccurate instructions, dispensing an inappropriate dosage, or incorrect labeling. Mislabeling pharmaceuticals is a common breach of duty that may be used by a patient’s legal team to prove negligence. Viable pharmacy medical malpractice claims will also be able to prove that a patient incurred serious damages. Pharmaceutical errors may worsen symptoms of a person’s existing illness or injury, prevent or stall recovery, create economic losses, or lead to pain and suffering. Award amounts for pain and suffering (non-economic damages) caused by negligent pharmacist behavior are often greater than compensation for economic damages, which may include medical expenses or loss of income. In addition to proving breach of duty and damages, patients must be able to demonstrate that a causal link exists between the two. Without proven causation, a pharmacist liability claim will not be viable. Portland medical malpractice lawyers Dave Miller and Bob Wagner have over 65 years of combined trial experience and have specialized knowledge of pharmacist negligence. Our law firm knows how to investigate and present evidence of medication and pharmacy errors. If you or your loved one suffered from serious damages due to a pharmacist’s error, Miller & Wagner will determine proof of negligence whether in the form of ignored allergies, drug interactions, or incorrect dosage, labeling, or instructions. Contact our medical malpractice attorneys serving Oregon and Southwest Washington today for a free consultation. Disclaimer: This content is for educational purposes and to provide general information and understanding of the law. The information should not be used as a substitute for legal advice from a licensed attorney in your state.